General Motors, like all auto manufacturers, is working on fuel cells. It has built quite many prototypes for more than 40 years, the latest being based on the Chevrolet Equinox. It has been extensively tested in the U.S. and also in Europe, where the cars wore an Opel Badge, and the name of Hydrogen4. 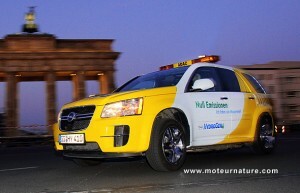 The car above is being used by German automobile-club ADAC, it’s an emergency vehicle used in Berlin. ADAC reached quite a milestone last week, with its fuel cell demonstration vehicle covering the two millionth mile of GM’s global fuel cell market test fleet. This is more than any other auto manufacturer (Daimler’s being second). That may not be enough to bring hydrogen cars at a dealer near you, but it proves at least that when the time of hydrogen car will come, GM will be at the forefront. The ADAC’s car is part of the Clean Energy Partnership (CEP), a program that has brought several hydrogen cars in daily use in Germany. It has been going on since 2009. GM’s two millionth mile is bringing back to the headlines, I bet it will happen again.